Can I Get Larger Implants? One of the main reasons Sonoma County and Marin County women have a breast revision surgery is to increase the size of their implants. A common complaint among many women is that they wish they had gone larger when they had their initial breast augmentation surgery. It is very important to have clear communication with your surgeon when determining the size. 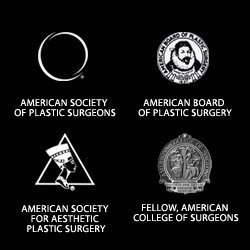 There are a variety of techniques that are used to assist in determining breast size. One of the most common breast size test is the rice test: another is the Mentor Volume Sizing System. Women who wish to have very large breast implants need to understand that the size is limited by their body dimension and frame. As the size of the breast implant increase, the width increases and can “out-pace” the size of your chest. Your surgeon will take measurements and advise you of your options. This entry was posted on Wednesday, July 25th, 2012 at 8:47 am	and is filed under breast revision, Breast revision implants. You can follow any responses to this entry through the RSS 2.0 feed. Both comments and pings are currently closed. « What is a “Double Bubble”?